I've not really done a favorites post in a while so I thought I would introduce some products that I've been rotating in both my makeup and skincare routines! I've picked up a good amount of items since the last time I did a favorites post, so it was hard to pick which ones to introduce first, but these are the ones that I've consistently been using. With the holiday collections already out, I'm excited to use a lot more than usual since there are way tooooo many beautiful releases available! Plus Sephora's Friends and Family sale is going to end soon (or it has JUST ended) and then we'll be closer to our VIB sale in early November. I was kindly given a F&F code by the beautiful Adri (check out her IG, it's full of so much skincare inspo!) so I've already ordered some products, but I still want to get more things. My list always gets so big but I've been really working on cutting it down! It's just too easy to add things that you want! Have you all decided on what you'll be getting? Over a month ago I was contacted by Trufora's PR and was sent five products to try out. Out of those five, these three are the ones that really impressed me! I take a lot of care when testing and trying out products, so I wanted to really get the best usage out of these before giving my opinion. Trufora is a clinically proven anti-aging skincare that is based on using science-based technology. They rely on using anti-aging ingredients without harmful or irritation-inducing properties. Trufora was created to represent what makes their products so different compared to others, that being their dedication to truth in their formulations and providing real results. Their products aim to treat, protect, prevent, and perfect the skin using their patented formulations. They are non-comedogenic and fragrance free, along with being vegan and certified cruelty-free. They have a page where they list some of their ingredients used in their products (not all), including their benefits and functions. The packaging enough has impressed me, as I love how it looks with the pink/white combination. Give me anything pink and you've already won me over! It is housed in well-constructed packaging and they are small enough to throw into a cosmetic bag if you're going away. You can tell that a lot was put into the packaging and especially the front side. Triple Action Exfoliator* is a kaolin clay-based creamy white paste with small biodegradable bamboo granules that cleanse and deeply exfoliate the skin. It includes glycolic acid (AHA) and salicyclic acid (BHA) for chemical exfoliation, both ingredients working very well for skin that has lots of PIH and acne. I also like that it uses natural AHA properties, like bilberry, sugarcane, and citrus extracts from orange and lemon. This is definitely not a green product but I do think it is effective for what it does. Every single time I used it my skin felt thoroughly cleansed and rejuvenated without a very tight feeling. Since I have oily, acne-prone skin, I deeply exfoliate pretty much 3-4 times a week (and use my clarisonic otherwise). For any other skin types, I think twice a week is what they recommend. You can use this product both as an exfoliator and mask. It is a thick white creamy paste that needs to be applied in heavy layers to get the mask treatment. I have tried these two ways and have enjoyed both experiences! The good part of this is that it has calming and soothing natural ingredients like aloe vera, which seems to be used as a property for anti-irritation. Shea butter is also an ingredient in this, and I think it may add to the creamy consistency since it's so high up in the list. This product also includes the ingredient Sodium Hydroxide, which many report to be highly toxic and irritating in a concentrated and unreacted form, but when balanced out with an acid it's not much of an irritant since acid/base reactions neutralize each other. Sodium Hydroxide is used in many soaps and cosmetics, often working as a pH adjuster since it's highly alkaline, with the end product not even being the true, pure form of SH (therefore cancelling out any possible negatives from its concentrated form). You still should be aware if your skin starts to have any reaction, just like with any product. Personally I really like this and I have not yet started to test the pH of my skincare products, so I'm unsure what the pH is for this, but I can tell you that my skin doesn't feel irritated or that it's been dried out. I could possibly even say that it is somewhat similar to Kate Somerville's Exfolikate, one of my favorite exfoliating products, since they share some of the same ingredients (not all, but some). If you have very dry skin or very sensitive skin, I probably would not recommend this but for those normal/combo/oily I think this possibly might work well for you (we are all so different!). This sells for 60ml/2oz for $45, 1/2 less than what Exfolikate sells for (2oz for $85). Intenstive Night Treatment* is a hydrating cream that plumps and smooths the skin, and includes anti-irritant properties to calm and soothe the skin. This product was formulated to work with laying over their Night Serum 85, which concentrates on intensive anti-aging benefits, so that it may enhance both products. You only need a small amount, about 2-3 pumps for the face (although they say to apply generously, 3-5 pumps, it may be too much for some) and you massage it lightly until it's fully absorbed. I love that it is enclosed in this packaging and uses a pump for sanitary benefits, since pot packaging is not at all good for keeping the product stable. This is a very light-medium thick cream that deeply hydrates. I always wake up with plump and refreshed skin the next day. I am very much about aging prevention so having a product like this has been great to use, I really can tell a difference in my skin's hydration content and also when I apply concealer it no longer clumps up at certain places. This is going to be great to use in the colder days, so glad that I have this! This specific product includes some great patented ingredients: Riboxyl (natural D-ribose from corn seed, a monosaccharide present in all living cells, restores energy to the skin), ProHyal+ (Hyaluronic acid; supporting collagen and elastin to retain and bind water molecules), MariMoist (complex if marine-based high water binding properties), Viniderm (rich antioxidant polyphenol French grape juice extract, anti-aging preservative action supports natural synthesis of collagen), Resistress (Sophora japnoica extract rich in plant-based flavonoids, stimulates skin and dermis defense systems against oxidation), and Kalpariane (ECOCERT registered, French Brittany brown algae, Alaria Esculenta (Wakame); antioxidant protection, firms and plumps skin). Along with extracts and oils like Sunflower Seed Oil, Aloe Vera Leaf Extract, Rosemary Leaf Extract, and Soybean Extract. This is 30ml/1oz for a sale price of $59, so it's not too bad compared to others but still quite pricey. Night Serum 85* protects, hydrates, and smooths away fine lines and wrinkles by using anti-aging and anti-inflammatory benefits of multiple peptides. This is a cream colored light lotion consistency that includes ingredients like Vitamin C, aloe, and oat avenanthramides. It works by using multiple forms of hyaluronic acid, apple derived saccharide, and a soy-based moisturizing complex. This stuff is a miracle worker. I think what makes it such an amazing product is using it along with their Intensive Night Treatment, those two together create such a powerful anti-aging mixture of products that really provide an amazing treatment for anti-aging. It absorbs an average amount of time and I like that it doesn't feel super heavy, especially since I like to use face oils at night and the two can easily feel too much together. This provides such a great hydrating treatment and really works at helping any aging signs you've got. It's plumped my skin and I even think it's been helping my breakouts and PIH spots. It has not caused me any irritation. The ingredients in this are really impressive: Actizyme (mushroom derived water soluble enzyme, an exfoliant that is pH based, gives a controllable exfoliation to use in combination with bio-retinols and peptides to further enhance their effect without irritation), Systenol A (retinol-like activity, protects against detrimental effects of UV exposure, has high antioxidant profile, inhibitory effect against UV induced erythema, and is antimicrobial and antifungal), Revinage (bio-retinol, mimics same positive effects as retinol to fight skin aging), DermaPep A350 (peptide with retinol-like activity, helps support natural collagen synthesis), DermaPep A530 (capryloyl pentapeptide-26, anti-flammatory peptide for irritated and sensitive skin), and Botaniceutical NI-peptide (neural inhibitor that has shown to reduce and smooth appearance of lines and wrinkles). The one negative I have to say about this is that it's really expensive for how much you're getting (15ml for a normal price of $80; currently it's on sale for $59). It is an extensive and potent anti-aging product, so I would advise to not use it nightly but maybe a couple times a week to extend how much you're given. I actually have not used this night after night, the most I've used it is about 3-4 times in a week. The best thing about this is that I've still gotten such great results even though I've not used it consistently. Ingredients (Intensive Night Treatment): Water/Aqua/Eau, Propanediol, Caprylic/Capric Triglyceride, Cocoyl Adipic Acid/Trimethylolpropane Copolymer, Diisostearyl Dimer Dilinoleate, Caprylyl Caprylate/Caprate, Candelilla/Jojoba/Rice Bran Polyglyceryl-3 Esters, Glyceryl Stearate, Isononyl Isononanoate, Butyrospermum Parkii (Shea) Butter, Glycerin, Bentonite, Behenyl Alcohol, Pyrus Malus (Apple) Fruit Extract, Ribose, Stearyl Alcohol, Cetearyl Alcohol, Ethylhexyl Isononanoate, Sodium Stearoyl Lactylate, Oryza Sativa (Rice) Bran Extract, Panthenol, Glycine Soja (Soybean) Extract, Xanthan Gum, Glycine Soja (Soybean) Sterols, Linoleic Acid, Phospholipids, Ethylhexylglycerin, Chondrus Crispus Extract, Yeast Extract/Faex/Extrait de levure, Helianthus Annuus (Sunflower) Seed Oil, Potassium Sorbate, Hydrolyzed Viola Tricolor Extract, Aloe Barbadensis Leaf Extract, Avena Sativa (Oat) Kernel Flour, Phenoxyethanol, Citric Acid, Alaria Esculenta Extract, Trisodium Ethylenediamine Disuccinate, Avena Sativa (Oat) Kernel Extract, Gluconolactone, Rosmarinus Officinalis (Rosemary) Leaf Extract, Sodium Benzoate, Vitis Vinifera (Grape) Juice Extract, Tocopherol, Sodium Hyaluronate, Sophora Japonica Flower Extract. Ingredients (Triple Action Exfoliator): Water/Aqua/Eau, Glycerin, Bambusa Arundinacea Stem Extract, Kaolin, Butyrospermum Parkii (Shea) Butter, Caprylic/Capric Triglyceride, Tridecyl Trimellitate, Stearyl Alcohol, Polyglyceryl-2 Stearate, Bentonite, Propanediol, Vaccinium Myrtillus Fruit Extract, Glyceryl Stearate, Oryza Sativa (Rice) Bran Extract, Glycolic Acid, Sodium Hydroxide, Saccharum Officinarum (Sugar Cane) Extract, Xanthan Gum, Avena Sativa (Oat) Kernel Flour, Phytic Acid, Ethylhexylglycerin, Citric Acid, Allantoin, Citrus Aurantium Dulcis (Orange) Fruit Extract, Citrus Limon (Lemon) Fruit Extract, Salicylic Acid, Helianthus Annuus (Sunflower) Seed Oil, Potassium Sorbate, Aloe Barbadensis Leaf Extract, Acer Saccharum (Sugar Maple) Extract, Chondrus Crispus Extract, Trisodium Ethylenediamine Disuccinate, Avena Sativa (Oat) Kernel Extract, Phenoxyethanol, Rosmarinus Officinalis (Rosemary) Leaf Extract, Gluconolactone, Sodium Benzoate, Tocopherol, Sodium Hyaluronate. Ingredients (Night Serum 85): Water/Aqua/Eau, Butylene Glycol, Caprylyl Caprylate/Caprate, Glycerin, Propanediol, Pyrus Malus (Apple) Fruit Extract, Bakuchiol, Caprylic/Capric Triglyceride, Raphanus Sativus (Radish) Seed Oil, Oryza Sativa (Rice) Bran Extract, Ammonium Acryloyldimethyltaurate/VP Copolymer, Elaeis Guineensis (Palm) Oil, Gossypium Herbaceum (Cotton) Seed Oil, Polyglyceryl-2 Stearate, Glycine Soja (Soybean) Extract, Bidens Pilosa Extract, Glyceryl Stearate, Citric Acid, Stearyl Alcohol, Linum Usitatissimum (Linseed) Seed Oil, Mucor Miehei Extract, Ethylhexylglycerin, Avena Sativa (Oat) Kernel Flour, Chondrus Crispus Extract, Potassium Sorbate, Helianthus Annuus (Sunflower) Seed Oil, Xanthan Gum, Allantoin, Aloe Barbadensis Leaf Extract, Tetrahexyldecyl Ascorbate, Phenoxyethanol, Trisodium Ethylenediamine Disuccinate, Avena Sativa (Oat) Kernel Extract, Palmitoyl Hexapeptide-19, Gluconolactone, Sodium Benzoate, Rosmarinus Officinalis (Rosemary) Leaf Extract, Tocopherol, Myristoyl Tripeptide-31, Sodium Hyaluronate, Capryloyl Pentapeptide-26. I cannot tell you how long I've been wanting products from Rosie for Autograph. This has been so hyped all over the UK blogging world and I would sit here all sad knowing that I could not get any items since Marks & Spencer doesn't ship Rosie's makeup products to the USA. I was lucky enough to get a friend to send me some items that I picked out from online! There are also shipping services available if you are wanting some products from the line, I've used forward2me a couple of times and have been very happy with their service. I'm not sure if M&S takes non-UK debit/credit cards, so you can use forward2me's personal shopping service to buy the items for you (there is a £15 fee though). The most I've ever paid for shipping has been about $30-ish (using DHL), so not too bad and actually about the same as Selfridges' shipping to the USA. If you don't know what Rosie for Autograph is, it is British supermodel Rosie Huntington-Whitely's beauty/cosmetic line that she created in addition her lingerie line. It is 100% vegan and is Leaping Bunny cruelty-free certified. She uses beautiful rose gold packaging and it is sold at a very affordable price (most items are under the £20 mark). She is notably known as being a former Victoria's Secret Angel but has delved into created a brand under her famous name. Lisa Eldridge once did a lovely makeup tutorial using both Rosie as the model and some of her makeup products, check it out here. I've always been in love with Rosie's makeup products just by aesthetic alone. After using some of the products that I got, I've fully fallen head over heels in love with her makeup collection. They are some of the most flattering colors and tones that I've ever used. Plus the rose gold and rose imagery on all of her products is just too beautiful! I'm only talking about the Magic Contour Bronzer today but I will soon talk about the rest of the products that I picked up. Magic Contour is one of the two bronzers available in her line, the other being a darker color called Bronzed Beauty. They both are on the very warm side but they are not at all uncomplimentary to wear. Even for fair skin, Magic Contour would be a great product to get and try out. I would say that Bronzed Beauty should be used with medium-darker medium skin tones or those with a considerable tan, but I'm not sure how it would fair out on much darker skin tones (I hope she comes out with more colors!). Although in the swatch you can easily see the warmness of the shade, once I apply it on my cheeks and forehead, it really works well with how light my skin is. 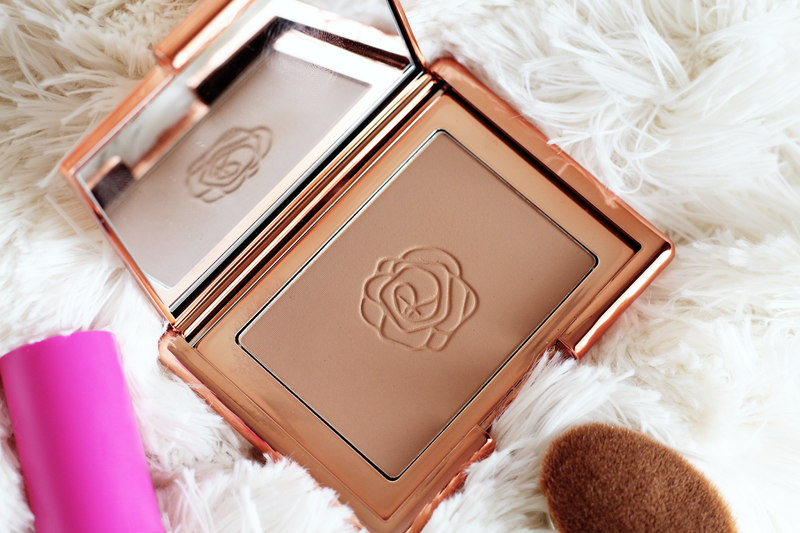 It is one of the softest matte bronzers I've EVER used, like seriously so soft. I use it with both with my MAC 168 Large Angled Contour Brush and MAC 130 Duo Fibre Brush. The Angled Contour Brush gives a harsher but larger product placement. 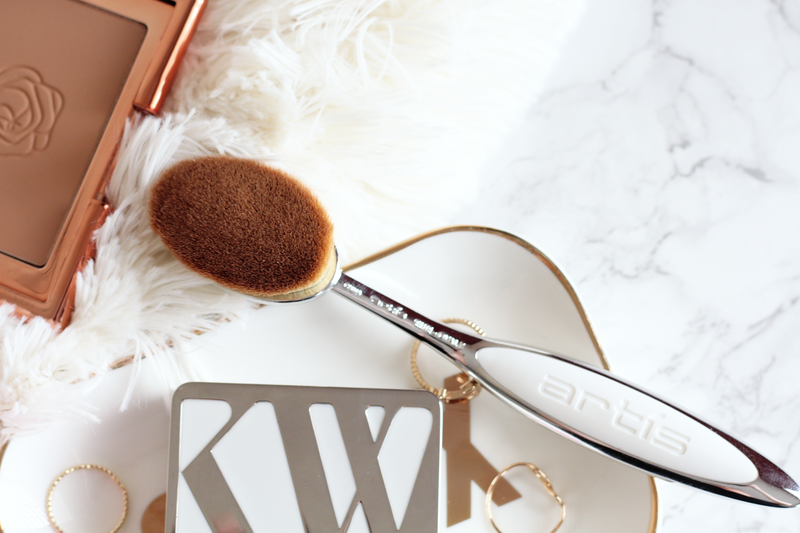 The Duo Fibre Brush is the best to apply the bronzer on my forehead so that it looks much more natural. You only need the tiniest amount at first since this bronzer is really so pigmented and a lot gets picked up by both brushes. I do believe that Rosie has come out with some makeup brushes but I've not seen them available online yet. I definitely recommend getting this product, especially if you're in the UK! It's such a beautiful bronzer and I'm so excited to get more products from her line. She has come out with a bunch of holiday collection items (candles, nail polish, etc) so be sure to get those while you can! Ingredients: Talc, Orzya Sativa (Rice) Starch, Dimethicone, Octyldodecyl Stearoyl Stearate, Zea Mays (Corn) Starch, Zinc Stearate, Caprylyl Glycol, Phenoxyethanol, Dimethoiconol, Hexylene Glycol, Isononyl Isononanoate, Dimethicone/ Vinyl Dimethicone Crosspolymer, Polymethylsilsesquioxane, Silica, Trimethylsilsilicate, (+/- Ci 77492, Ci 77491, Ci 77499, Ci 77891). I'm pretty sure this has been exhausted beyond all means to talk about but I've only just recently been able to try this product out myself. I'm very picky when it comes to concealers, and since I'm so fair it's already hard enough to find ones that are light enough to give me some luminosity in my under eye area. Within the past few months I've fallen in love again with my Charlotte Tilbury Retoucher in 1 Fair, but unfortunately it's not light enough for me (it's actually too dark). As much as I adore it, I really prefer a product that not only covers but lightens up my complexion, too. I've not been using my heavier concealers lately and have been liking a lighter consistency, so I was hoping to find another one similar to the Retoucher. I randomly found a giftcard in my bag to Sephora (score!) and quickly ordered this, hoping that it would be the right color. 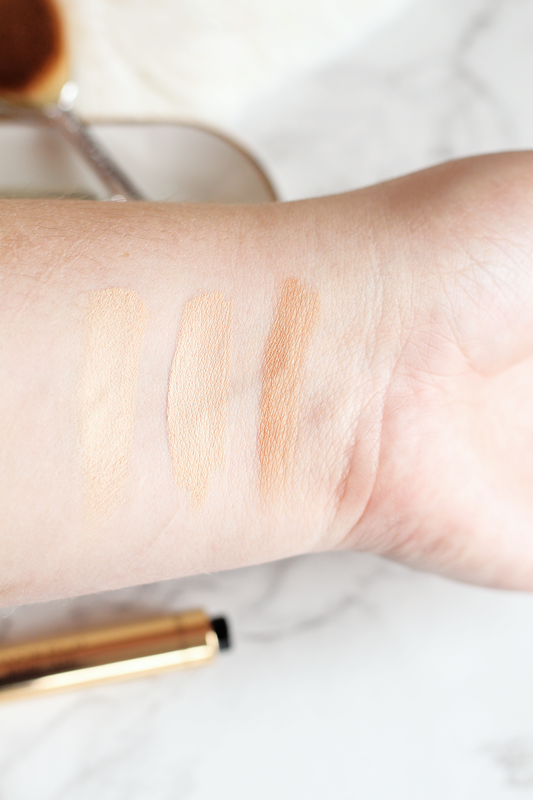 I lean more on the yellow side in my neutral skin tone, so I picked the shade 02 Luminous Ivory since it's for fair-light complexions with yellow undertones. Luckily it ended up being a great match! I know that this isn't necessarily a concealer but I've been using it in place of a proper one. This is exactly what I've been looking for! 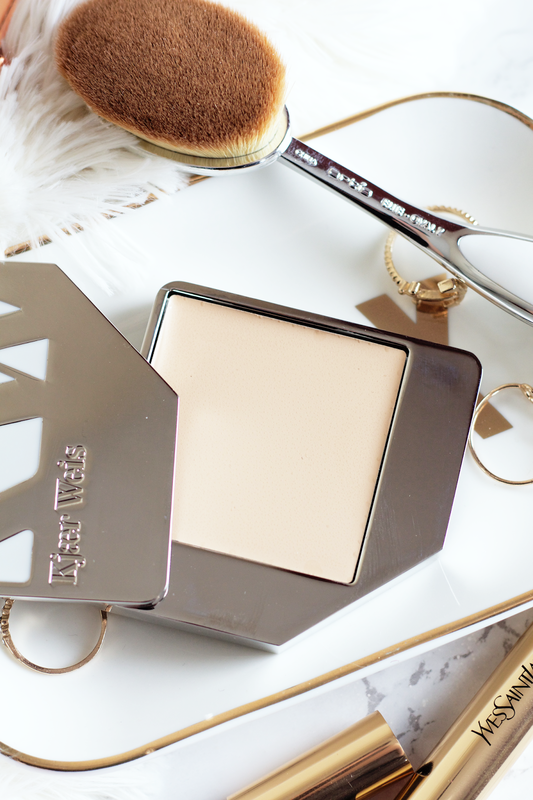 It brightens and conceals my under eye area, along with being a very light consistency. All I usually need is 3 clicks for both of my eyes and I'm ready to go. I usually set it with my Laura Mercier Secret Brightening Powder, which makes it even more of a luminizer. I like to use my Artis Oval 4 brush to buff it in and it does it so perfectly, it's like these two were made for each other! I also use it on other parts of my face, like my chin and forehead. I really am loving this product! I still enjoy using the Retoucher but it's going to be on the back burner while I use this. I totally can understand the hype about this, too! This is probably going to be one of my HG products. Ingredients: Water, Cyclomethicone, Glycerin, Talc, Paraffinum Liquidum (Mineral Oil), Peg/ Ppg-18/18 Dimethicone, Magnesium Sulfate, Trideceth-3, Methicone, Methylparaben, Squalane. [+/- May Contain: Ci 77891 (Titanium Dioxide), Ci 77019 (Mica), Ci 77492 (Iron Oxide), Ci 77491 (Iron Oxide), Ci 77499 (Iron Oxide), Ci 77007 (Ultramarines), Ci 77510 (Ferric Ferrocyanide), Ci 77742 (Manganese Violet), Ci 75470 (Carmine), "NF8897"]. Kjaer Weis is a Danish luxury green beauty brand that uses natural and organic ingredients. Founded by veteran makeup artist Kirsten Kjær Weis, the brand was created to "fulfill a need for natural and organic color makeup that doesn’t compromise luxury or performance." Seeing as the skin is our body's biggest organ, it is vital to use products that don't include ingredients that harm it. All of their products are either certified natural or certified organic, along with being cruelty-free and gluten-free. Natural preservatives used in Kjaer Weis products have been carefully chosen and extracted from minerals, plants, and wildflowers. Their makeup contains no parabens, silicones, petrochemical emulsifiers, or synthetic fragrances. On this page you can take a look at their ingredients and their breakdown information. 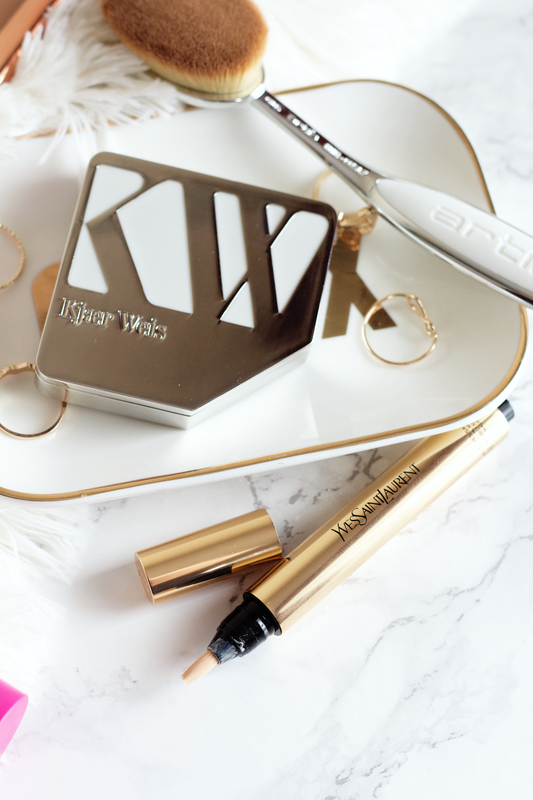 Kjaer Weis is a new brand that I've come to really love! After buying three of their new lipsticks, I knew I had to get more from them. I then started trying out some of their eyeshadows (which I also adore! 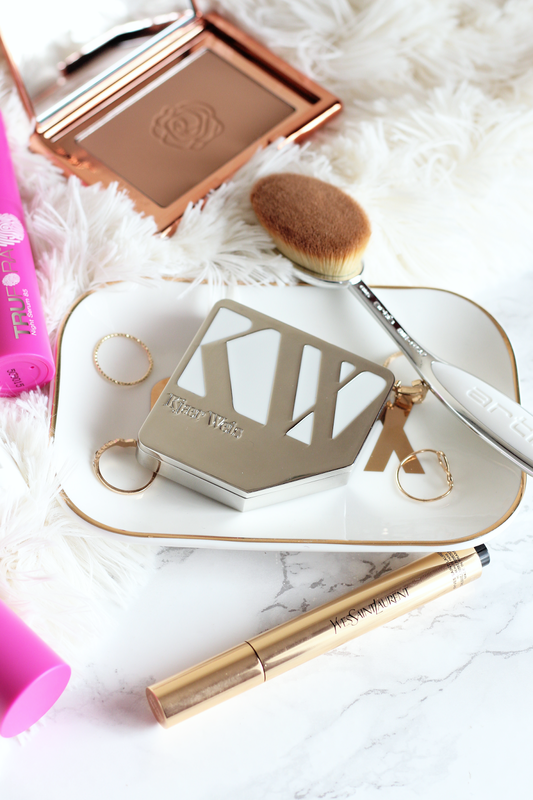 review coming) and it made me love Kjaer Weis even more. I've always been interested in their face products but wasn't sure if it would fit my oily skin since it does use ingredients like coconut oil. I'm not the biggest fan of using cream face products (besides foundation and concealer) but their Cream Foundation and Cream Blush have been in my mind to try out. Luckily my older sister did an order at Integrity Botanicals and I picked out this foundation for one of the free samples that you get. After using up the sample I knew that I had to buy the full size! I chose the shade Lightness, which is their lightest shade and is a neutral tone. It honestly matches me 100% perfectly! I've really never had a foundation match me like this one does. Being super fair and a neutral tone has always spelled disaster for me when it comes to choosing foundations. Not to mention having oily skin, which is high maintenance on its own. This foundation is on the drier side once it sets and gives a heavy full coverage, but if you're light handed with it then it can easily be a medium-full coverage. It gives a semi-matte finish on me and more so when I use powder over it. I've been using Charlotte Tilbury's Air Brush Flawless Finish over top of it since it's a very light micro-fine powder. I have to say it's not the easiest foundation to buff in if you're using the wrong brush, so I've settled on using my Artis Oval 7 brush since it works the best with it. Kjaer Weis does sell makeup brushes and they do have a foundation brush but it's way too small to use with the product, in my opinion. Their blush brush is bigger and I often see people use it with this foundation, but I've yet to buy it myself to see if I like it or not. Since it is tougher to buff in, I like to dot it on my face first (putting more where I have blemishes/redness) and then work it into my skin. Since it is not a cheap foundation I really make sure to use what I can without being excessive. I notice that I can go 4-5 hours (depending) without needing to touch up before my face starts to look 'glowy.' Not oily, glowy. I actually don't mind my face looking like that as it really makes my skin look healthy. I've never had a foundation look like that before but I really like it! I'm not sure if I could wear this during summer-time or on hot days but for seasons like Fall/Winter/Spring, I think this works really well for me. I should note that it fully covers up my redness and acne without using too much of the product, so that enough makes me give it a big thumbs up. The foundation pan is able to be changed out once its finished and is a cheaper price compared to the compact, so that's a plus. I love Kjaer Weis' packaging, it feels and looks super luxurious. I always dislike when brands offer products at a higher price but the packaging is made so cheap, it turns me off from buying anything. I'm looking forward to trying more from this brand! So happy that I decided to just take a leap and try them out. I'm really so impressed with everything I own! After trying my best to hold off on buying any Artis brushes, I finally gave in and bought three of them to try out since I was needing a new foundation and concealer brush. These have been overly hyped and I didn't want to add to that hype but I've really fallen in love with them! The ones I have are the Oval 4, Oval 6, and Oval 7 brush (the other two I'll talk about in a different post sometime soon). I decided to buy the Oval 7 since it seems to be the most hyped out of all of them. Not many places still carry this style but I knew I had to get this one from their Elite Mirror Collection. Not only for aesthetic purposes (love the white!) but also no other variations appealed to me. I have used the cheaper versions of this brush and I have to say they do not at all compare. The cheaper ones are very stiff and they soak up a lot of product, along with the packaging being very under par in quality. The bristles on these brushes are carefully made so that they don't absorb a lot of the product you are applying, which was easily seen from the first application I did using this brush. They are supposedly made with CosmeFibre, a trademarked product used only with Artis brushes, which is made up of very fine monofilament fibres that are constructed for applying makeup products. They have tapered ends that apply product more consistently than animal hair, and on average have 3-10 times as many individual fibres than conventional brushes. This way less product gets trapped between the individual fibres and is instead held between the fibre tips, making it easy to pick up and lay down product. Since it does have a fine tapered shape, it does really well in blending the product. It also supposedly has 'shape memory' that helps keep and retain the shape of the brushes, and can easily be revived by putting it under hot running water and allowing it to dry reshaped into its original form. The bristles are very soft and they don't at all irritate my skin, which was a problem I had with the cheaper versions. I also like how strudy and luxurious the handle and overall packaging is. It looks expensive and I can easily grip onto it without it slipping in my hand, even when I'm being a bit rough with it. This has become my main foundation brush and I've used it not only with the Kjaer Weis Cream Foundation but also my Charlotte Tilbury Light Wonder. I do think they are on the expensive side and it's a very personal decision whether or not to spend that kind of money on these brushes. I do think they are worth it, however, but these are not for everybody. You do have to get used to the feeling of using them and using techniques that suit you best. I really like to push up, not so much 'brush,' the product into my skin. I do like to also directly push and dab the product so that it's blended in well and especially when I'm trying to cover up redness/acne. If you prefer to use the brushes you're using now, I don't see any reason to splurge so much on these. If you are needing some new brushes then I say try these out and see if you like them! I still like using my other foundation brushes but I've mostly been using these Artis brushes instead. What have been your favorite products to use lately?